Q: When we abduct, imprison, torture, or force another person by violence and credible threats of violence to do our bidding, are we engaging in acts of a) dehumanization, b) demonization, or c) dis-humanization? Think hard, because a lot depends on the answer. 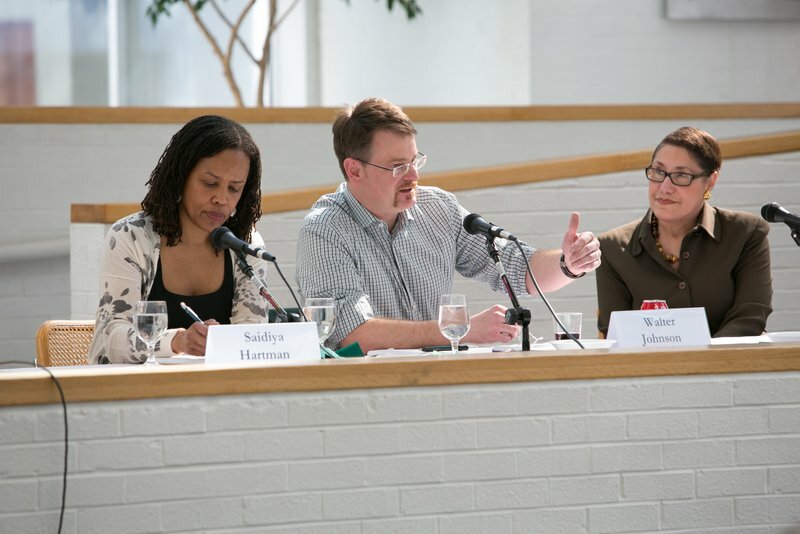 If, as many participants at a recent conference on Human Rights and the Humanities held at the National Humanities Center maintained, you pick a), then you lay the groundwork for a universal concept of human rights, rights that all people have simply by virtue of their species identity. A given acthuman trafficking, female genital mutilation, honor killingmight be legal in some systems, and might even be inflicted or tolerated by the state itself, but if it can be said to dehumanize the victims, then the community of nations might feel justified in taking action to stop the practice in the name of humanity. As one participant, Evelyn Brooks Higgenbotham of Harvard University pointed out, the term de-humanization acquired great political force in the course of the nineteenth century, and was used by many in the abolitionist movement, whose success is universally accounted one of the greatest victories in the history of human rights. You might, however, feel that b) demonization should be preferred because it identifies more precisely the mindset of the abuser. 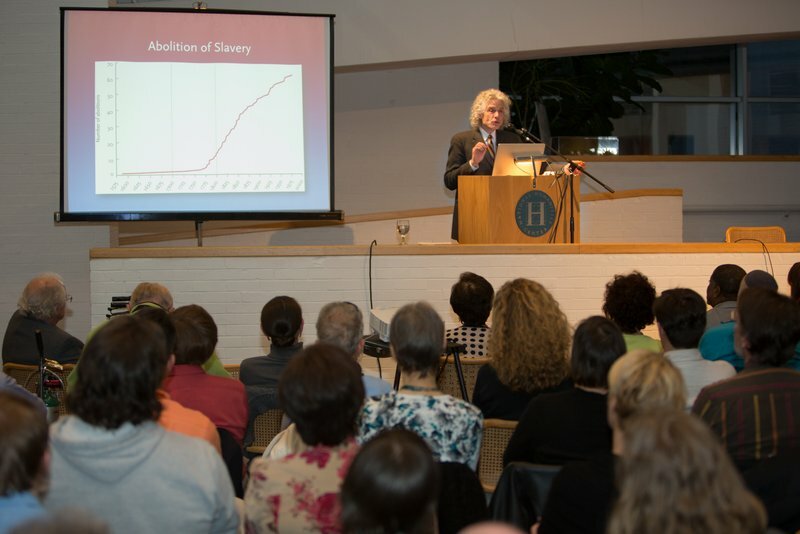 The conferences keynote speaker, Steven Pinker, author of The Better Angels of Our Nature: Why Violence Has Declined (2012), took this position, saying that such acts as genocide or witch-burning have been justified by the perpetrators on the grounds that the victims were not truly human, that they were aligned somehow with a nonhuman power of wickedness and must be eradicated for the common good. If we see acts of violence as having been following on such acts of classification, then we can have a better understanding of how people who are not sociopaths can commit unconscionable acts in good conscience. Walter Johnson of Harvards History Department had another view. Speaking specifically of chattel slaverythe subject of his recent River of Dark Dreams, an astonishing and appalling examination of the densely nested set of concepts and material practices that constituted the cotton industry in the Mississippi Valley before the Civil Warhe argued against both a) and b). Slaves were not, he insisted, de-humanized; their humanity was readily recognized by slave traders and slave-owners. Nor were they demonized. The master-slave pair-bond is one of the most ancient and durable of human relations; indeed, as one speaker pointed out, for most of that history, slavery was an accepted and fully legal practice everywhere on earth, and was only finally outlawed from the last nation in 1979. Johnson argued instead for c), the neologism dis-humanization, which suggests that the victim has been deprived not of his or her humanity as such but only of certain human traits such as the capacity for independent volition. As this exchange suggests, the discussions at the conference tended to turn not on actions as such but on the rationales for action. The brutalities that constitute what we now think of as human rights violations generally reflect some prior, less obviously culpable act of reflection and description. We understand the euphemistic power of phrases such as enhanced interrogation techniques and sleep management to make torture appear more managerial and rational than it would under a literal description; less widely recognized is the anti-euphemistic gesture of preparing to torture people by describing them as inhuman or subhuman. The human rights movement seeks to address such abuses in part by correcting the initial category mistake. The first corrective step is to draw a circle around all of humanity and to declare that those inside the circle possess rights that we are not obliged to extend to the blades of grass we mow, the water we drink, the trees we grind into pulp, the nails we drive, or the oysters we eat (live). Drawing this circle was not the work of a moment, but the result of a centuries-long, multi-national, multi-cultural process that has, especially in the last several decades, transformed the humble concept of compassionate assistance to the suffering into a powerful interlocking set of organizations, just one of which, Human Rights Watch, is funded by a grant of $100 million from philanthropist George Soros. Today, the leading human rights organizations have celebrity sponsors and access to the highest levels of power. All this represents an impressive example of consensus-building and organization. But on what conceptual foundation does it rest? Or, to put the question directly: what is a human being, that it can claim special rights? The framers of the most important document of the twentieth century, the 1948 Universal Declaration of Human Rights, refused to respond to such questions, presenting their thirty articles as an uncontested consensus on the rights due to all humans. Their silence struck some as imperious or evasive, and over time the UDHR has come to seem less a universal declaration and more like a bill of rights for a very select groupcitizens of liberal constitutional democracies who work for a living, hold property, cherish their freedoms of opinion and expression, value abstractions like the free development of [ones] personality, and insist on the right to privacy. The rights of other kinds of peopleof whom there may be billionsare not adequately registered in the document, and some rights that are included are framed in ways that favor some humans at the expense of others. People are said by the UDHR to have a right to work, to free choice of employment, and even to periodic holidays with pay, but no right to, for example, collective bargaining. The result, as Robert Pippin of the University of Chicago pointed out, is that the UDHR has put up no resistance to the exploitation of labor at the hands of global capital, which has increased its advantage steadily ever since the document appeared. Perhaps, one might think, if the framers of the UDHR had begun with a sounder concept of the human, they would have come up with a more truly universal conception of rights. But where would they have gotten such a concept? When have we ever had a clear understanding of the human? Not for a long time, according to Lynn Festa of Rutgers University, who argued that our species self-understanding has been contested as far back as the eighteenth century, when a new kind of interest in human origins focused attention on race. From the human rights perspective, race has always been a disturbingly ambiguous concept. Humanity was said to constitute a race, a distinct life formbut subgroups of humanity were also races. One awkward but profoundly influential implication of this lexical redundancy was that it became possible to think that the differences between the races were as radical as the differences between species. And since the overarching question driving the inquiry into race was human origins, it also became possible, for those so inclined, to rank races according to their proximity to some aboriginal condition. Thus, to think of humanity in the eighteenth century was, for many, not just to ponder the ontology of the human race, but to gauge the progress that certain races had made in their time on earth. One popular conclusion was that some, notably western Europeans (later, Aryans), had come an impressively long way to their present excellent state, while others remained, as it were, at squares one or two. To some eighteenth-century empirical minds, mankind presented the aspect not of a Family of Man but rather of a motley aggregate of relations, some of them distantno kin at all, reallyand some embarrassing. Darwin set the discussion on an entirely new footing, and his paradigm remains dominant today. But as Gregory Radick of Leeds University explained, Darwinism represents a decidedly mixed blessing for the cause of human rights. Groups unlucky enough to be classed as non-human in any way or degree are likely to become victims of human rights violations, and while Darwin, a committed abolitionist, believed fervently in the unity of the human race, his work, by positing a graded physical evolution from primates to homo sapiens, seemed to lend scientific support to the view that some races were more highly evolved than others. Darwin can hardly be held responsible for all the theories that have claimed Darwinian warrant, but the fully intended effect of his work was to make the category of the human porous to other species, subject to the same forces as animal life in general, and less able than before to claim a divinely-ordained special destiny, much less special rights denied to other species. Focused as it was on race, Darwinian thinking on human rights has had a deeply equivocal effect on the concept of human rights. On the one hand, Darwin made possible a dramatic broadening of perspective, which philosopher Peter Singer has described as an expanding circle of empathy in which people became newly able to imagine a kinship beyond kin, an affiliation with others beyond their immediate group. In the nineteenth century, Radick said, the circle of empathy expanded to include races other than the Caucasian; and humanitarian movements such as abolitionism, as well as various forms of compassion-based philanthropy, flourished. It is difficult to imagine widespread acceptance of the concept of human rights without such a broadening of sympathy. In the twentieth century, however, partly under the powerful influence of Singer himself, the circle grew even greater to include animals. This consequence has been cheering to animal rights activists, some of whom have gone so far as to claim that animals deserve political representation, but vexing to those who feel that in order to believe in human rights they have to forget Darwin. In short, the most commonly accepted account of humanitywho today is not Darwinian?represents both the enabling condition of, and a formidable objection to, the case for human exceptionalism that grounds the concept of human rights. Nor is Darwin the only problem for human rights. Many thinkers with scientific credentials today tell us that race is a chimera, a social construction that lacks biological integrity. There are, they contend, no distinct races within humanity. Human rights groups are pleased to claim scientific support on this point, but they are far less receptive to scientific perspectives that would blur distinctions between the human race and, for example, mammals, primates, or organisms; nor do they welcome any scientific reduction of human beings to cells, molecules, strings of amino acids, self-replicating proteins, or atoms. In fact, you will not get a concept useful to the cause of human rights from a biologist or a chemist. Must we then forget not just Darwin but science in general before we try to alleviate human suffering? This question brought Pinker to the microphone to propose an ingenious solution. Evolution, he pointed out, never rests; natural and sexual selection is a continuous process. Species are being altered all around us, but the alteration is occurring at a rate we cannot perceive, like the hands of a clock that advance with decades and centuries rather than seconds and minutes. The evolution of homo sapiens in particular is difficult to grasp because as Darwin pointed out in The Descent of Man, we have succeeded in exterminating all transitional species, so that although we might have Neanderthal genes, there are no Neanderthals. Actual continuity produces apparent discontinuity, so why not make a virtue of necessity and simply declare that the human species today is what it is? On this pragmatic basis, we could then proceed to define the conditions of human flourishing without troubling ourselves with metaphysics or theory, and could feel confident in our definition as long as no relic population turned up to demand its half-human rights, forcing a new round of reflection. 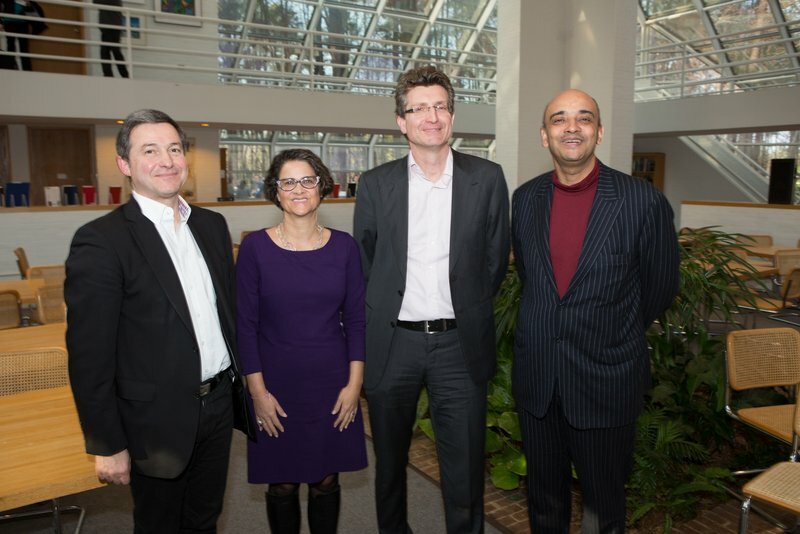 Leading off the last panel of the day, Anthony Appiah gave voice to a gathering mood of pragmatist exasperation. Surely, he insisted, we can describe human existence without recourse to race. Ethnicity, for example, is a far more defensible concept, as are religion, class, and a host of other markers of collective identity. We need no clean and definitive concept of the human to accomplish the work of human rights; all we need is a simple determination to work to eliminate or minimize needless human suffering. It fell to Stephen Hopgood of the University of London to close the formal proceedings in maximally pragmatic fashion with a ferocious argument to the effect that the human rights movement had become its own worst enemy and should be abandoned altogether. The only reason such a program had ever been able to advance around the world, with well-meaning organizations and individuals extending helping hands into some of the darkest corners of the world, he said, was that it had been backed by American power, which alone could account for the fact that such culture-specific fetishes as respect, dignity, or equality before the law had ever been accepted as species characteristics. As American power has waned, he continued, the liberal-democratic provenance of these qualities, and the deeper normative presumptions they both concealed and conveyed, have become increasingly evident to the supposed beneficiaries of human rights work, to the point where the human rights movement is now seen, in places such as India, as the kind and loving face of neo-imperialist paternalism. Even Doctors without Borders, Hopgoood noted, has largely abandoned rights talk as hopelessly compromised by its associations. Indeed, the very notion of human rights grounded in universal species characteristics now stands as an impediment to the kind of rooted activism that might actually do some good. And so, he concluded, it is no tragedy that we are living, as he put it in his recent book, in the Endtimes for Human Rights, because the demise of this project might make way for more effective ways of alleviating human suffering by focusing, for example, on public health. But would it really be better if we just forged ahead without troubling ourselves about terms, concepts, or rationales? Pippin was unpersuaded, insisting that no matter how tainted the term human rights had become in the eyes of some, it was not inherently compromised, and had been responsible for a lot of good work. Others ventured that if we followed Hopgoods suggestion and focused on health care, the initiative would pass to one of the most thoroughly corporatized sectors of the global economy, with results calibrated to benefit stockholders first and suffering humanity second. Others worried that if we dispensed with the concept of human rights, there would be no argument to make against such cherished local customs as stoning, child labor, whipping, or public executions. And, speaking hyper-pragmatically, is pragmatism the best fundraising approach? Would Bono, Madonna, Angelina Jolie, or George Soros intervene on behalf of suffering individuals in distant parts of the world if the cause were not couched in inspiring universal terms? Maybe notso why should a few small quibbles interesting only to scholars stand in the way of the project of global compassion? Why indeed? But then, why, really, does anyone care about the suffering of people in distant places? Why should they? Whatto cite Hamletis Hecuba to us or us to Hecuba? The mysteries surrounding the circle of empathy deepen as the circle expands, pitching us into abysses of introspection and wonderment. But these are human spaces, unexplored by other creatures. To be sure, what Hamlet calls the native hue of resolution can on occasion become sicklied oer with the pale cast of thought; but to what species is untroubled resolution native? Not the human. Human beings must think, and while thinking can interrupt the flow of actionit can make cowards of us allit can also lead us to feel anothers suffering, to imagine a kinship bond with those we will never meet, to conceive of rights and obligations, to make sacrifices for no reason connected to self-interestand then to derive satisfaction from the sacrifice. 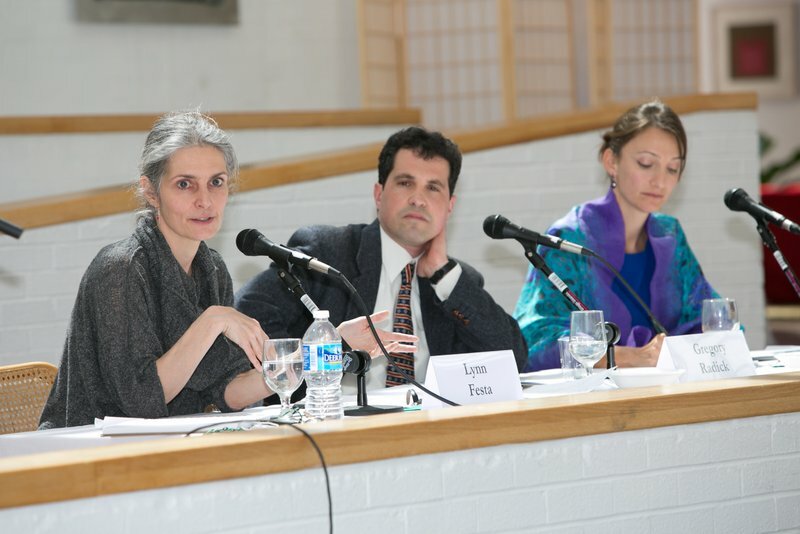 This, the third of three conferences on this subject, focused on the concept of the human in human rights. The previous two conferences, in 2012 and 2013, focused on factors of culture and the state respectively. Don’t talk about humanity anymore!!! For more than hundred billion dollar!!! They are one of the poorest people!! Who can’t even feed their Childs!! And then what’s their sin??? They only think and believe different!! From those who has the power to kill!! And that’s the worst sin that anyone can do!!! In front of those who have the power!!! How many places in the world??? And how much money is spent in our world?? As long as these are the terms and conditions!!! The humanity and human rights!! !